A few months ago on a lark I built one of the Klon clone kits (a distortion pedal for those who either don’t play electric guitar or live in a cave), a Grind Customs Chimaera, since it wasn’t expensive and I thought it’d be interesting to see what one sounded like. I thought I’d done a great job wiring it up — all very careful and clean — and when I finally fired it up I was a bit surprised: it sounded horrible. Well, if you read my other post you might see a theme building here. I hadn’t plugged it into my pedal board, I was in my workshop and was using a brand new wall wart, and not a particularly cheap one mind you. I’d actually opened up the Chimaera’s case and was trying to figure out what I might have done wrong when I thought, hey, power supply. So I took it out and plugged it into my pedal board, where I’m using a Fuel Tank Chameleon (which I highly recommend) and everything was just fine. And I realised that possibly some of the problems I’d been having while breadboarding might be due to power supply noise. Guitarists who use batteries don’t run into power supply noise but you can’t run a dozen pedals off of 9 volt batteries for very long, and most of the pedals on the market now don’t even use batteries. I’m always surprised that music stores even sell wall wart power supplies as they’re notoriously noisy, but cheap, and guitar pedal power supplies are very expensive. Hundreds of dollars. 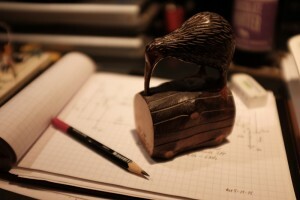 You can build your own for a fraction of that, and they’re not remotely difficult. A basic knowledge of electronics and a three pin integrated circuit. It might reveal my age a bit to admit that I remember building 9 and 5 volt power supplies back in the late 1970s for my electronics and robotics projects (I was a little nerdy kid — not much has changed really). 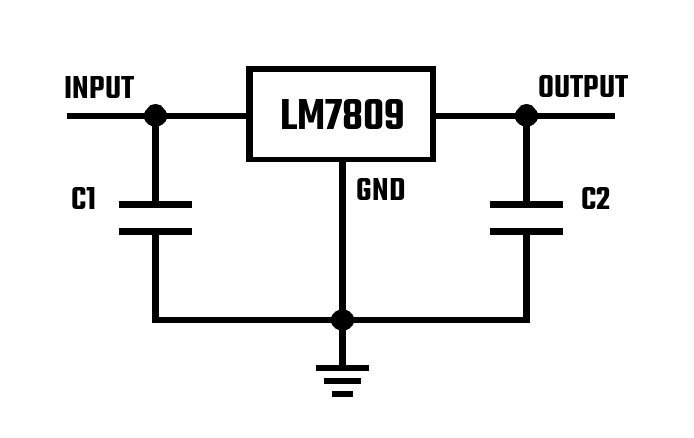 I’m using the same three pin integrated circuit, called a LM7809, that comes in a TO-220 case (it looks like a big transistor). You ground the center pin, put power into one end and out the other comes the voltage you want. Nice. Internals showing the perf board, wiring, and some big electrolytic capacitors. The TO-220 voltage regulators are screwed to the bottom of the case using a fancy-schmancy isolating heat sink mount. Since the majority of the costs were the wall wart and the case I figured I might as well build two power supplies into the same case, so I went down to the local parts store, bought a couple 7809s, an aluminium enclosure, capacitors, PC perf board, switch, LED, etc. I cut the perf board in half and mounted it in the case by sliding it into the slots in its walls. There was actually room for four power supplies but I didn’t need four. I could have put a step-down transformer in the case but that would have possibly created more electrical noise inside the case where I want things quiet. It would also mean bringing 220 volts into the metal case rather than 12V (safety issues), and would be more complicated. So I ended up using a 12 volt wall wart instead. You might find you already have one lying around the house. If so, and you use an existing case rather than buying one and the whole thing costs only a few dollars. 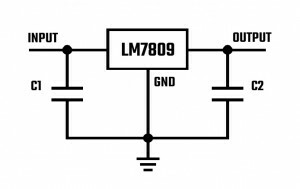 The LM7809 costs 61 cents in the US, or in New Zealand, $1.38. 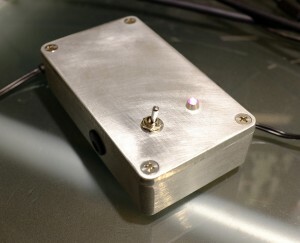 The finished dual 9 volt power supply. Pink LED. 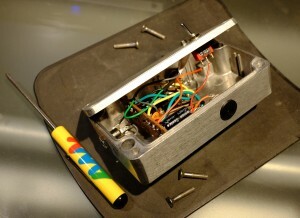 In a nutshell (okay, a verbose nutshell), it’s possible to build a well-regulated, clean 9 volt power supply for guitar pedals for a fraction of what finished units cost. They admittedly do provide some features not included in my little box (such as short circuit protection), but my purposes were to have a power supply for prototyping, not my pedal board. And frankly there’s not much difference.